This In Focus presents the first sustained analysis of this enigmatic painting – now regarded as a key work in Bell’s oeuvre and in the histories of British and European modernism. 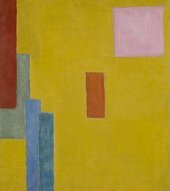 Vanessa Bell made Abstract Painting in 1914, as one of a handful of paintings and collages that made a bold and early intervention into the international abstract movement. Yet during her lifetime she shared them only with her immediate circle of ‘Bloomsbury group’ friends, and much of the critical response to Abstract Painting has therefore occurred relatively recently, since its acquisition by Tate in 1974. This In Focus explores the ways in which Abstract Painting appears to reject subject matter yet still operates in the world, whether in the local context of Bloomsbury ideas and collaborations or in the global context of European modernism and Islamic textiles. It considers the political implications of Bell’s abstraction in relation to theories of individualism, the modernist reinvention of the home and the outbreak of the First World War, and reads Abstract Painting ‘in conversation’ with works by Bell and other artists. Published in January 2017, the project is authored by Dr Grace Brockington (University of Bristol) and includes contributions by Dr Claudia Tobin (University of Cambridge).